Lynn Lieber Goldstein posted a message. Hope you had a very Happy Birthday! Wow - 55 already? I never realized how much younger i am than you. Maybe I'll see you at the next reunion. 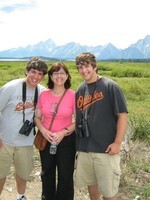 My husband Bruce and I at the Grand Tetons. Here I am with my sons Philip and Steven.